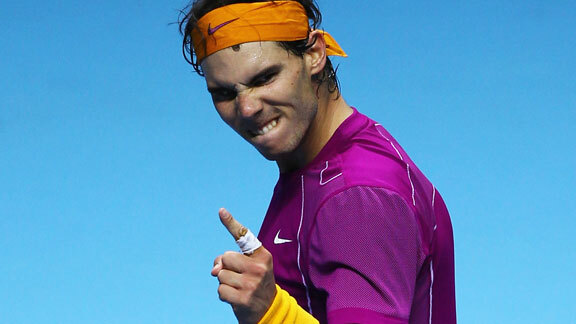 It has been a stellar , or it would be justified to say dream year for Rafa. At a tender age of 24 he claimed all the Grand Slams hence becoming the youngest to get a Career Grand Slam in his kitty.Hence increasing his grand slam tally to 9. Else, he got a clean sweep at the ATP tournments at clay, an achievement for what he shall be proud , and would remember for a long time. Though his end season came to bit of ooh's and aah's where he fell short of attaining his first ATP Finals tournament falling short in the finals against Federer. Yet his streak did not fell short even after the end of season , for being most anticipated he got nomination for the 'Laureus Sportsman Award' by Laureus & 'Athlete of the year' by USSA(United States Sports Academy). Nadal, who won the Laureus World Newcomer of the Year Award in 2006, faces tough challenge from the giants like Indian legend Sachin Tendulkar, Formula 1 World Champion Sebastian Vettel and footballers Lionel Messi,and others. USSA on the other hand is one of most respected organisations providing educational programs for sports imparting degrees and certifications on sports. The names of the six Nominees for the Laureus World Sportsman of the Year Award will be announced in early January. They are voted upon by the Laureus Media Selection Panel. The winner, chosen by the Laureus World Sports Academy, will then be unveiled during a televised Awards Ceremony in Abu Dhabi on Monday, 7 February.So for all the Rafa fans all of you vote as many as possible at official site of USSA and make your revered athlete a winner.